The new Swan 100 expresses at best the philosophy of the Nautor's Swan shipyard in the construction of great yachts, in which the highest levels of comfort and performance are expressed without compromises. The deck and sail area have been constructed to ensure excellent performance and ease of management of all manoeuvres, designed according to modern criteria which foresee an extensive use of technological materials like carbon. The spacious internal areas allow the shipyard to offer numerous layouts, which the owner can plan with Nautor's designers to create an environment in line with the future owner's functional and style preferences. At the centre of the boat is a spacious deckhouse, which encloses the lounge and dinette with two large C shaped sofas facing each other. From this area access is gained to the bow side sleeping quarters for the crew which is composed of two double cabins with a dining area, in front of which is the galley. The sleeping area for the owner and his guests is on the stern side where there is a spacious suite the entire width of the boat with lots of space, a double cabin with 2 single beds and another with a double bed. Each cabin is equipped with private en suite bathroom (as are the cabins in the crew's quarters). Externally in the area behind the deckhouse, there is a large relaxation area with sofas and numerous accessories. The command station is situated aft, positioned to ensure the helmsman the greatest visibility in any condition, as well as the possibility of keeping under control the sail plan at any speed. The new Swan 100 is a cruise yacht able to offer high performance, it is very elegant and comfortable and its interior is richly equipped with technological futuristic solutions. The yacht is rigged as a sloop, while the engine is a Perkins Sabre 265 HP. For further information please contact The Nautor Group; via dè Tornabuoni 15; 50123 Florence; tel. 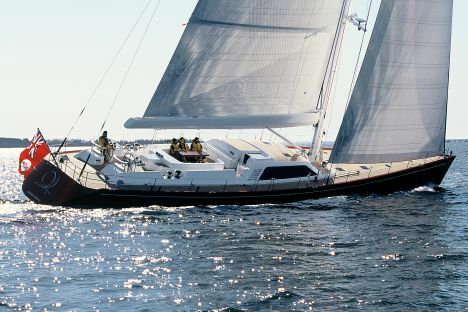 +39 055 2645612; fax +39 055 288038; web site www.nautorgroup.com. Sailing surface: (Lug sail and Genoa at 110%) 449,90 m2.